“Marker #2” (2009) by Mel Kendrick. Sculpture Milwaukee is returning to Wisconsin Avenue. 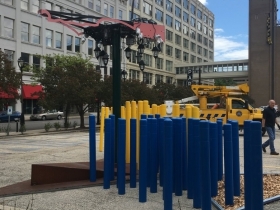 The annual installation places a group of sculptures outdoors, giving everyone in Milwaukee the opportunity to view and enjoy world-renowned works. 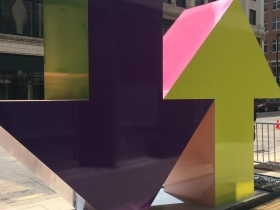 “Sculpture Milwaukee is an all-season, all-access opportunity to view some of the finest art in the world,” says Steve Marcus, chairman of the board of The Marcus Corporation and founder of Sculpture Milwaukee. Sculpture Milwaukee will be installing an entirely different group of works from more than 20 artists. These works be available for viewing June-October 21, 2018. Abakanowicz was a Polish artist who created works for more than 40 years before her death in 2017. She worked extensively in textiles and sculptures. Growing up under a Communist regime, Abakanowicz’s works deal extensively with individuality and free expression. 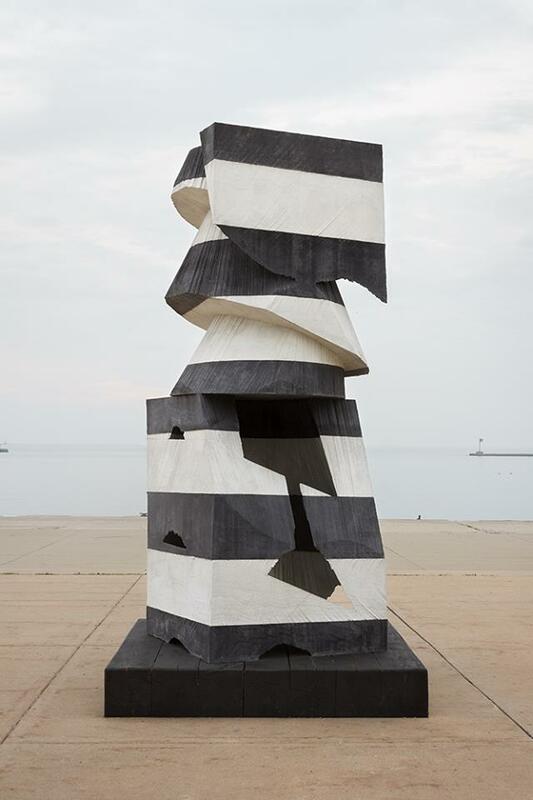 Her featured work will be The Group of Five, 2014, a temporary work on loan to Sculpture Milwaukee. Abakanowicz has a permanent piece, Birds of Knowledge of Good and Evil, on display on the Kilbourn Avenue Boulevard at Prospect Avenue. Glynn is a Los Angeles sculptor and performance artist. Common themes of her work are growth and decay. Her featured work will be Untitled (Burgher with extended arm), 2014. This piece was made from cast molds of Auguste Rodin’s work The Burghers of Calais, 1884-89. Kendrick is an American artist who works with a variety of mediums, particularly woodworking. His work focuses mainly on space and geometry, the horizontal and the vertical. Marker #2, 2009 is an abstract, black-and-white sculpture. Its interior shapes change depending on where the viewer stands. 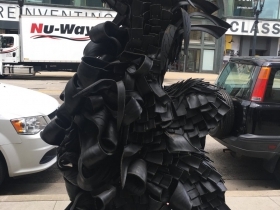 McCaw and Budsberg are a Milwaukee-based duo that collaborates in performance art and sculptures. Their work is atmospheric, usually taking the viewers into a different time and setting. Their sculpture, Skew, 2018, is inspired by the shape that barns take after time and weathering. This piece uses sheets of white pine from a fallen tree on the Budsberg family’s property in northern Wisconsin. Thomas is a New York-based artist. He works in a wide variety of mediums including photography, sculpture and film. His work often focuses on black male identity, pop culture, and social commentary. Liberty, 2015 is bronze sculpture coated in automotive paint. The statue is balancing a basketball and formed in the likeness of the Statue of Liberty. Venet is a French artist who has had a 50-year career. Common elements in his art include line, form and shape. His installations are often made of steel. 97.5° Arc x 9, 2007 are nine lines at a 97.5° degree bend. Wurm is an Austrian artist best known for his One Minute Sculptures. His work focuses on social commentary, often with a dash of both melancholy and humor. Wurm implements everyday objects into his sculptures. Half Big Suit, 2016, is a business suit in pale pink paint. Drawing inspiration from the Underground Railroad, Rastafarianism, Zen Buddhism, ancient Egypt, and 19th and 20th century African sculpture, Biggers utilizes various art forms to create multi-faceted works that collaborate with the past to help us understand our present. BAM is a life-sized warrior cast in bronze that references the killing of unarmed civilians in America. Part of a new generation of Cuban artists testing the limits of the changing political atmosphere of Cuba, and of the changing attitudes towards Cuba in the world. 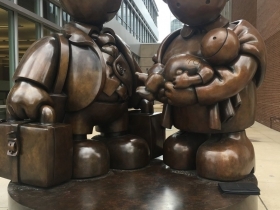 His sculpture, Nostalgia, 2013, references the situation of travel for immigrants. Since 2007, Friedman has been creating sculpture and sculptural environments made of aluminum foil, roasting pans and baking tins. The supple, yet durable, materials are easily shaped and keep their edges and finger-print divots when cast into the high-gloss modern material of stainless steel. Hazmat Love, 2017 features two men in protective hazmat suits wrestling. The viewer is left to decide if they are trying to save themselves or each other. British artist is known for his cheerful, candy-colored paintings made with household paint and, more recently, over-sized sculptures that recall the flora and fauna around us. The scale of Bud, 2016 is playful, standing as tall as any adult. The plant is both wondrous, the miracle of life that returns after a long Wisconsin winter, and monstrous in its size. Known for her paintings and ceramic sculptures, in the last several years Jackson Hutchins has begun to create architectural insertions made from cut and carved pieces of glass melted together. In her re-purposed bus shelter, Reason to Be, 2017, the artist replaces the functional glass walls with baroque decorative panels, some with phrases and words that recall the advertising function of these public shelters. She has also replaced the bench with a hammock, taking participants from the fast pace of downtown’s business environment, giving them a place to rest, and perhaps dream. Part of a generation of artists who in the 1970s and 80s carved out new arts spaces in former industrial buildings in downtown New York, reviving neighborhoods through their activism and social engagement. Smith’s Alice (Seer II), 2005 is part of a broad body of work in sculpture, painting, drawing and prints based on Lewis Carroll’s book, Alice in Wonderland. Smith’s Alice is enormous for a little girl, perched next to her imaginary pool of tears. Mexican artist Bosco Sodi creates paintings and sculptures using materials from the earth. Deeply influenced by the Japanese interest in the beauty of imperfection, Sodi sees aesthetic value in the disarray of everyday life. In recent years, he has been building stacks of cubes made from earth. These elemental building blocks, which have built cities throughout human history, take on new meaning at this scale. 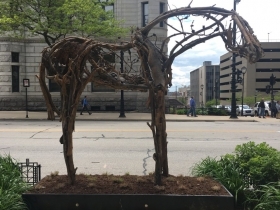 By placing Sodi’s Untitled, 2017 on Milwaukee’s main street, the juxtaposition of nature versus culture, modern versus ancient, poses questions about the shifting urban landscapes that we create today. 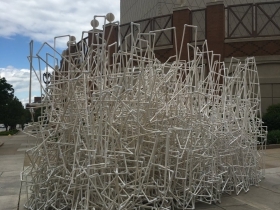 Installation of sculptures begins on May 10. All of the 20-plus art works, with the exception of one borrowed from a private collection, will be available for purchase with a percentage of each sale going toward Sculpture Milwaukee’s future installations. This is something everyone should embrace, if possible. I applaud everyone involved in this project. I wish that the business leaders would realize the opportunities this brings to the city, its people and visitors.